AlcoMate Premium AL7000 Breathalyzer introduces patent-pending Precalibrated Replaceable Sensor Module technology, professional accuracy and modern design into a convenient, easy-to-use alcohol tester. 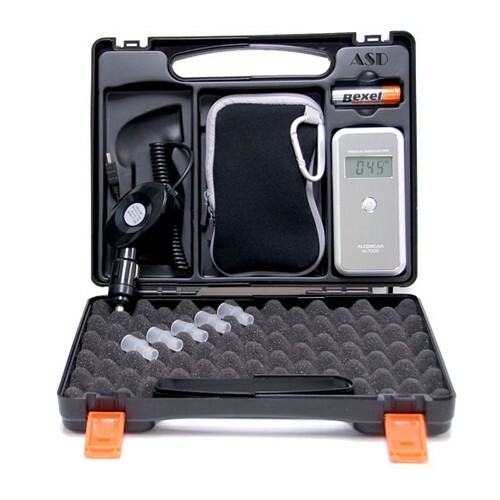 Suitable for health and law enforcement professionals, as well as consumers looking for a top of the line breathalyzer. Save time and money with the AlcoMate Premium AL7000! AlcoMate Premium AL7000 Breathalyzer is a reliable and accurate alcohol tester that measures blood alcohol concentration BAC in a subject breath. Among its most important features is a field replaceable sensor module that completely eliminates the need for sending out the device for calibration. It is true for every breathalyzer that after 6 months to a year, the internal sensing part becomes contaminated and drifts away from initial factory settings. For this reason breathalyzers must be re-calibrated as often as possible. The Calibration process often requires sending the device back to its manufacturer or shipped to a nearest authorized service center. In the case of the AL7000 there is no need to go through this recalibration process. instead, you will purchase a factory pre calibrated sensor module and replace it yourself via an access door located on back side of the device. In fact it is simpler than replacing batteries, pop the old sensor out and insert the new one in. This simple step restores the AlcoMate Premium AL7000 Breathalyzer to its new condition. The AlcoMate Premium AL7000 breathalyzer is engineered with a back lighted 4-digit LCD display suitable for low light conditions. One button operation makes its user's interface extremely simple- press to turn the unit on, perform the test, and let the device turns itself off- Sorry that it couldn't get any simpler. The AL7000 highly intelligent detection algorithms and innovative testing methodologies are driven by an advanced Micro controller and packaged in a sleek industrial design. The AL7000 uses very little power hence allowing more than 200 tests out of two AA batteries. When you own the AL7000 you are confident that you have all you need to keep yourself safe and sober before you get behind the wheel. The AlcoMate AL7000 with 3-decimal-point accuracy satisfies all professional testing requirements. Beside personal use, the AL7000 has a diverse class of users such as civilian and military law enforcement officers for field test, HR for suspected employee testing, social services as well as clinical and forensic test facilities. Field Replaceable Sensor The AlcoMate Premium AL7000 Breathalyzer snap-in sensor replacement technology guarantees unit readiness in remote field testing situations such as maritime and military applications. The replaceable sensor unit stores the breathalyzer calibration parameters in a non-volatile memory chip. Replacing the AlcoMate Premium AL7000 sensor is a simple and fast procedure. The sensor is housed in an easily accessible chamber. Simply open the rear chamber door, pop the old sensor out and drop in a factory pre-calibrated one. That simple! Approved by Government Regulatory Agencies The AlcoMate Premium AL7000 Breathalyzer has been tested and approved by the Department of Transportation(DOT), National Highway Traffic Safety Administration(NHTSA), Food & Drug Administration(FDA), and US Coast Guard(USCG). The AlcoMate Premium AL7000 Breathalyzer was found to comply with all necessary standards and was certified as a professional level alcohol screening device. These government bodies ensure the quality of our machines in a non-biased manner. 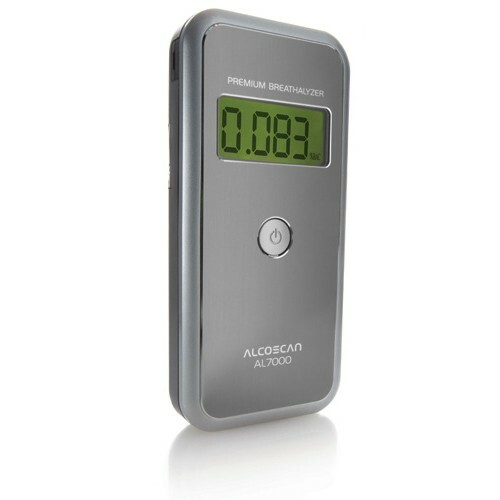 The consumer can trust that the AlcoMate Premium is a quality product that is proven to provide accurate measurements of blood alcohol concentration. Precision Digital Display The AlcoMate Premium AL7000 Breathalyzer has an extended 3 Decimal points (0.000%)and back lighted LCD Display for dim light situations. Deep Lung Air Sampling AlcoMate AL7000 designers have raised bar for all professional alcohol testers when first incorporated a pressure sensor in the path of breath flow. This important technique ensures that not only a "deep-lung" breath sample is taken for measurement, but it detects any interruption or uneven breath flow that resulted in a "Flow" error message. The operation will be stopped and test must be repeated. Additionally, the pressure sensor keeps track of a consistent breath flow for a certain length of time to ensure that the subject is not trying to be less sincere with the process. A true blood alcohol level should only be extrapolated from the deepest samples of breath. Disposable Mouthpiece The AlcoMate disposable mouthpiece ensures safe and sanitary testing and it is easily replaced to maintain a sterile testing environment. Self-Diagnostic Test At power up, the AL7000 goes through an extensive self test to ensure system integrity before it announces its readiness. When an error occurs during testing, the AlcoMate Premium AL7000 Breathalyzer lets you know what went wrong. The audible error beeps also help preventing an incorrect use. Automatically Tracks Number of Tests The built in test counter will let you know how many tests you have performed with a given sensor. This is useful to determine when you may need to replace the sensor. ISO9000 Manufacturing Standards AlcoMate Premium AL7000 breathalyzer is built in a manufacturing facility governed by the rigorous ISO9000 quality standards and procedures. We are dedicated to ensuring the highest level of reliability and quality in our products. Product reliability and customer satisfaction are our number one priorities. You can be confident that the AlcoMate, like our other breathalyzer products, is manufactured to the same exacting standards and will provide years of service. 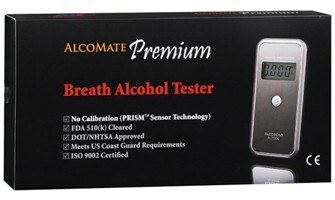 The AlcoMate Premium AL7000 Breathalyzer uses pre-calibrated and field replaceable sensor module. A significant drawback to most portable breathalyzer is the frequent re-calibration that they require. In critical situations such as maritime applications where on-board Breathalyzer must be fully functional, it can be problematic if the machine has not been recently calibrated. Unfortunately, the re-calibration process for most breathalyzers requires that the unit be physically mailed or taken to a professional service center. This can be a significant cost in both time and money. The accuracy of a non-calibrated machine has always been challenged in court of law if measurements are being used in a legal proceeding. With the AL7000 you will not have these problems. The factory calibrated and fresh sensor module can eliminate the delays and complications of re-calibration. The AL7000 "snap out" and "snap in" replacement technology allows you to maintain accurate testing easily without the chore of shipping the unit off to the manufacturer so frequently. Extend Your Breathalyzer Life In every breathalyzer, the alcohol sensing element (the sensor) is the heart of the machine. Every test adds certain amount of contaminants to the surface of this sensor. As time passes, these contaminants adds up to a level that sensor's electrical characteristics drift away from initial factory setting. Knowing that a calibration procedure does not remove these contaminant but only compensates for parametric divinations caused by them. Experience has shown that we can only calibrate a sensor twice or at most for a third time. Beyond that, the built ups are so great that sensor looses its sensitivity all together and must be replaced, inconvenient, time consuming and with a cost that often exceeds the value of your breathalyzer. At this time your are forced to purchase another breathalyzer. With the AL7000, you will not have the problem we mentioned. You always replace the old sensor with a factory calibrated fresh one. Starting with a fresh sensor means no history of contamination hence you have dramatically extended the life of your AL7000. Changing sensor is like buying a new breathalyzer. The AlcoMate Premium AL7000 Breathalyzer is the only breathalyzer on the market that offers the ability to maintain original accuracy in the field.